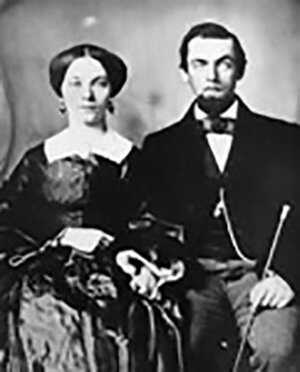 Jack Casement was working as a contractor for an Ohio railroad when he met Frances "Frank" Jennings, the daughter of a farmer through whose homestead ran the right-of-way. In 1857 they married, and though they made a home together in the town of Paineville, Ohio, Jack did not settle down. The letters Jack and Frances exchanged illuminate the experiences of a "railroad widow" and her hard-working husband. Railroad work took Casement and his brother Dan across the northeast until Jack went to war in 1861. That August, Confederate forces surprised Major Casement's battalion at breakfast. Chaos broke out among the Union troops; most fled or were captured. Casement restored order among the remainder and led them to safety. Honored for his initiative, Casement eventually rose to the rank of brigadier general. His men on the Union Pacific would know him as "General Jack." Casement left the army determined to return to railroad work. 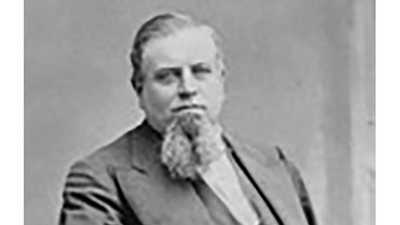 Soon, an opportunity presented itself; the Union Pacific hired the Casement brothers to improve upon the miserable amount of track laid in 1865. Jack headed to Omaha, Nebraska in February 1866. It was not an easy parting. Jack harbored a romantic nature, and he and Frank had lost a young son to illness just the previous November. "Darling I long to be with you and I seem to miss little Charlie more than when I am at home," Casement wrote. "I think of him constantly. I love you dearly and hope to be with you soon." For Frances, her husband's absence was terrible, but she remained steadfast. "Think of me often," she wrote, "as well as business all the time." Casement threw himself into his work. Most ingenious among his preparations were boxcars he built atop Union Pacific undercarriages. They served as bunkhouse, kitchen, dining hall, office, pantry, and supply depot. Each had a small arsenal in anticipation of trouble from Plains Indians. A constant presence during construction, they would confront Casement's men repeatedly along the westward-growing track. General Jack led the Central Pacific's workers with the same combination of efficiency and toughness that distinguished his army career. Crews moved at a walking pace, each gang divided to accomplish specific tasks. Casement's men averaged two miles per day, although they could complete up to seven miles, depending on the terrain. Casement faced many frustrations along the route. Bad weather destroyed work that had taken his crews days to complete. Indians raided supply stores. Union Pacific leadership was schizophrenic -- it could and did halt construction needlessly. Obtaining materials for the road was a constant strain, and money became ever more troublesome, especially as the work neared completion. "We will finish track laying this month," he wrote Frank in April 1869, "but the Lord only knows when we will get paid for it." To make money on the side, General Jack took grading work and opened general stores in towns along the route. Casement hastened home to Painesville when he could, and stopped by when traveling on business. He was home enough to father two sons by 1869. But truth was he did not return often, and the separation created a strain in his relations with Frances. Her house, though filling again, seemed all the emptier without her husband to complete the family. "Jack he is a mighty smart boy," she wrote of son John. "He talks of his Papa but poor child he knows but little of him it is too bad and you can never half appreciate your children -- you have had two of the smartest boys call you Papa that was ever born -- whether you know it or not -- I do." His letters always offered solace. "Write to me very often. I had the blues the worst way last night I know of nothing that will keep them off better than frequent letters from you if I cannot have you yourself." Jack Casement remained a dedicated correspondent and loving spouse. However, work consumed his energies, and he grew ever more attached to the railroad builder's life. He spent whole winters at end-of-tracks towns, leaving Frances alone to worry about his drinking, which could be a problem. "Things that Pay in This World"
In October 1868 Frances had not received word of Jack in a month. She could not conceal her disapproval. "I had about concluded that you had taken yourself off to China, but a despatch tonight informs me that you are still this side of the Ocean and I should think trying to see what you can do -- eight miles of track is a pretty big thing I suppose. I expect the reason you are not able to write me once in a while is that you are bending all your energies to out-do everybody else and do the biggest thing that ever was heard of. There are a few things that pay in this world and I hope that is one of them." Frances Casement would get her husband back -- but not for good. After his crews laid their last rail, Jack Casement returned home to Painesville for a while. But the railroad soon called him away. Having accomplished the biggest thing that ever was heard of, Jack and his brother Dan would go on to lay track all across the Western hemisphere. In 1883 Frances Casement formed the Equal Rights Association in Painesville, Ohio, and worked for the next thirty years for women's right to vote. Charles Crocker was the first Central Pacific Associate to ride the completed transcontinental road, tracing his former wagon route back east.